Hospitals E.R. 's throughout America have physicians who specialize in saving shooting victims. During summer months the “season of shootings” begins at Harbor-UCLA Medical Center in Los Angeles. On June 23 at 2:25 a.m., two teenage gunshot victims walked through the front door Harbor-UCLA Medical Center. They walked through the front door at 2:25 a.m., no EMTs, no police. The hospital staff calls it the homeboy ambulance service: patients brought in with injuries often from gang shootings.While the trauma team assesses the youth Dr. Brant Putnam, a gun shot wound specialist, is racing down from the operating room, where he was performing surgery on another patient. From the entry wound - the size of a nickel - Dr. Brant Putnam guesses that the bullet is a .45, but it's what he can't see that worries him most. 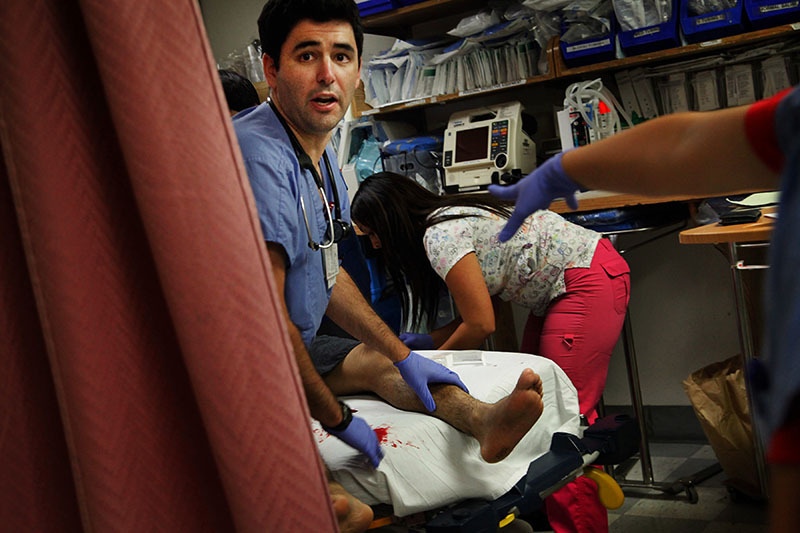 The boy, a teenager most likely, lies naked on Bed 2 in a trauma bay at Harbor-UCLA Medical Center. His brown skin, slick with sweat, is ashen.